Club Republika is located in downtown, on the corner of Karađorđeva Street and Pariska Street, at location of former club Andergound and club Soho Republic. If you are looking for a place which will fulfill your expectations, if you are fans of delicious cocktails, clubbing atmosphere and you want to hear best Djs, then club Republika is just a right place for you. Klub Republika is new and elegant place, which will remind you of New York clubs. Interior is minimalists and special charm of this place is that it's practically built into the Kalemengdan fortress. The brand new ''duo concept'' of this club, where bar and club will work separately. In bar Rebuplika, during a whole week, you can expect refreshing cocktails, beautiful setting and and excellent club music. Club Republika will work on Fridays and Saturdays and will host some of biggest names of DJ scene. 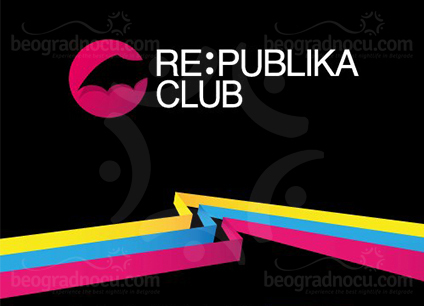 With such music program, club Republika is one of rare clubs in Belgrade with true meaning of word ''club''. It's a place, where you can exclusively listen to music played by Djs. Club residents will be celebrated local Djs: Oysha, Starčević, Ike and Miki. Do not miss a chance to experience something new, something memorable - word ''party'' in true sense of the word.